Benedetto Odescalchi was born at Como on May 16, 1611, and died in Rome, August 11, 1689. He was educated by the Jesuits at Como, and studied jurisprudence at Rome and Naples. Urban VIII appointed him successively prothonotary, president of the Apostolic Camera, commissary at Ancona, administrator of Macerata, and Governor of Picena. Innocent X then made him Cardinal-Deacon of Santi Cosma e Damiano on March 6, 1645, and, somewhat later, Cardinal-Priest of Sant' Onofrio. As cardinal he was beloved by all on account of his deep piety, charity, and unselfish devotion to his duties. When he was sent as legate to Ferrara in order to assist the people stricken with a severe famine, the pope introduced him to the people of Ferrara as the "father of the poor", "Mittimus patrem pauperum". In 1650 he became Bishop of Novara, a capacity in which he spent all the revenues of his see in order to relieve the poor and sick of his diocese. With the permission of the pope, he resigned as Bishop of Novara in favour of his brother, Giulio, in 1656 and went to Rome, where he took a prominent part in the consultations of the various congregations in which he was a member. 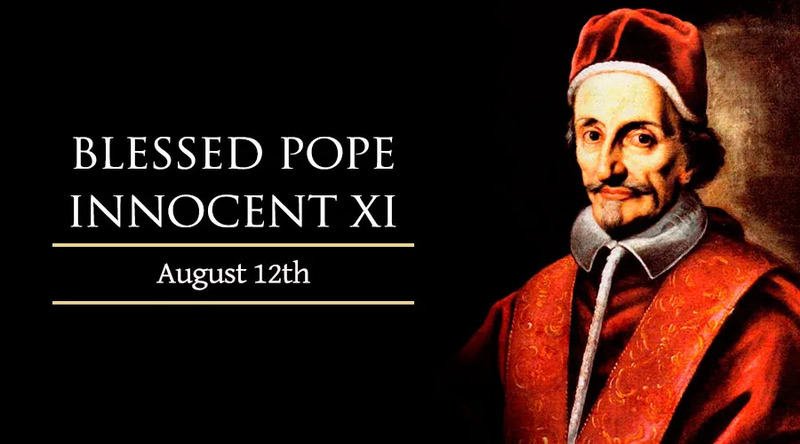 Odescalchi was unanimously elected pope on September 21, 1676, and he took the name of Innocent XI. Immediately upon his accession he turned all his efforts towards reducing the expenses of the Curia. He passed strict ordinances against nepotism among the cardinals, and he himself lived very parsimoniously and exhorted the cardinals to do the same. His pontificate was marked by the prolonged struggle with Louis XIV of France on the subject of the so-called "Gallican Liberties", and also about certain immunities claimed by ambassadors to the papal court. He died after a long period of feeble health on August 12, 1689. The cause for his canonization was first introduced in 1714, but the influence of France forced it to be suspended in 1744. In the 20th century it was reintroduced, and Pius XII announced his beatification on October 7, 1956.